Administrators can create Algo Defaults for X_TRADER users and configure them so that end users cannot override their values. Click Algo Configuration Mode at the bottom of the Customer Defaults and User Settings | Customer Defaults windows to show the Algo Defaults fields. 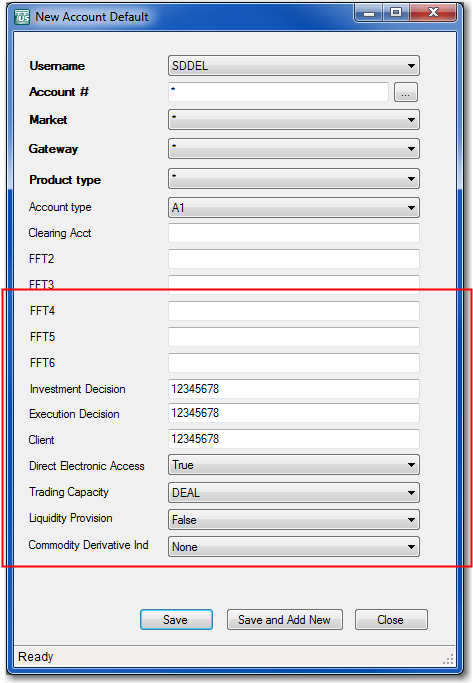 You can use these settings to assign MiFID II tags to both custom and TT Algos. When creating new Algo Defaults, the following options are available for supporting MiFID II compliance. NOTE: The more specific algo default values will override "*" values when submitting algo orders. For example, a Customer Default algo with LME values would override a Customer Default algo with "*" values if the trader was sending an LME algo order. Tip: To add multiple profiles that reuse most of the same settings, change one or more of the settings for the saved profile then click Save and Add New. Repeat for each additional profile as needed. 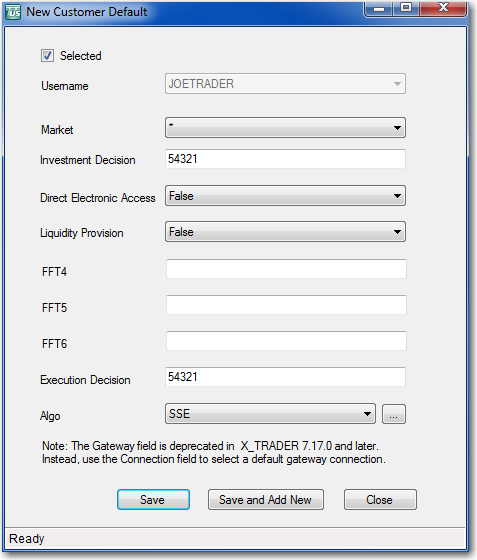 Determines whether the algo settings profile is available in X_TRADER. If checked, the profile is available to select in X_TRADER Algo Defaults. Otherwise, it is greyed-out. 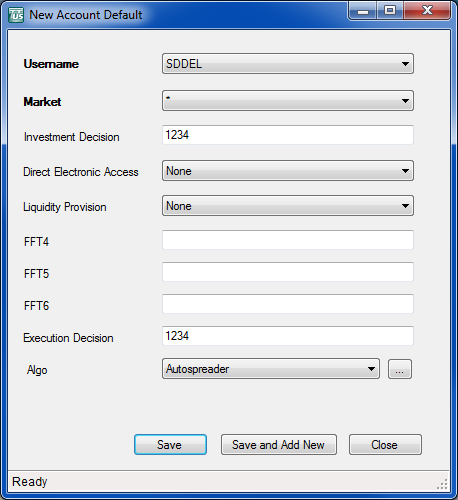 Sets which markets the user can trade with the selected algo. The default setting is "*" to apply the settings to all markets. 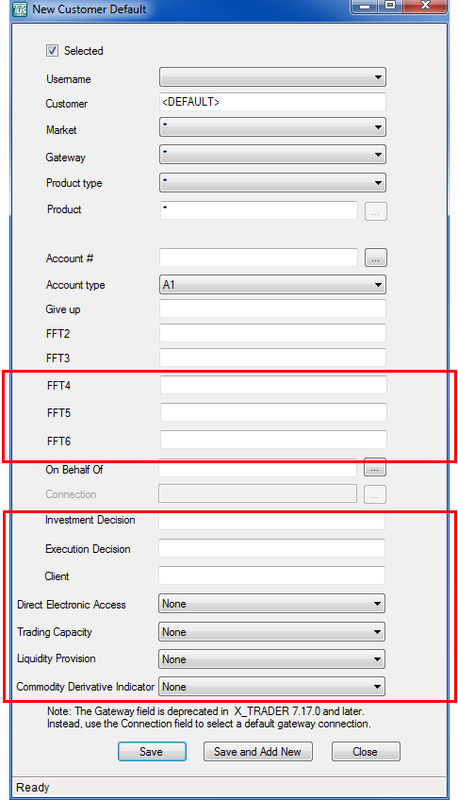 In the Exchange Settings pane, select a TT Gateway and click the Prevent Duplicate Orders checkbox and set Order Threshold to the number of duplicate orders allowed per second. When checked, the duplicate order check is enabled for the account.